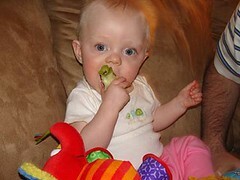 Our daughter Daisy enjoying an apple. For the last few days I've been toying with the idea of using flickr to handle the heavy lifting of hosting some images for Janney Family. For those of you unfamiliar with flickr, it is a web site that allows you to store, search and share you photos across the web. What it also allows is direct posting of an image to your blog, like the one to the right. This post is my first attempt at using the service and so far it's pretty easy to do. There was some work involved in getting the generated code just right. But otherwise, there was little effort on my part other than uploading the photos, giving flickr access to my blog and creating some copy. I'll be experimenting with this approach over the coming weeks - maybe Sam will too. Last, but not least, click on the photo to learn more about my virgin flickr profile and see what the site is all about if you're not familiar with it. © 2019 janneyfamily.com | all work is licensed under a Creative Commons License.